Sundaram’s embrace of installation art and the mis-en-scène parallels Kapur’s own championing of the postmedium condition as the decolonial art endeavour. Sundaram’s aesthetic investment in the political is usually made with reference to his formative years in Europe in the late 1960s, in India in the 1970s during Indira Gandhi’s Emergency (the aberrational twenty-one-month period of martial law), and his association for almost two decades with the SAHMAT Collective. SAHMAT (which also means ‘compact’ or ‘agreement’ in Hindi) took shape in the wake of the horrific murder of Safdar Hashmi, a member of the Communist Party of India (CPI) and a theatre artist and activist, in 1989. Attacked by a group of thugs whilst performing a street play in a working-class district of Delhi, Hashmi became the avant-garde martyr for many artists and activists on the Left. The collective ‘emerged from a violent interruption of committed artistic work, and it answered this violence by an eruption of outrage leading to a formation that combined what might be seen as the avant-garde of artistic protest with the avant-garde of politics’. Beyond Sundaram’s ongoing involvement with this avant-garde collective, his career has seen him operate within a tradition of artists on the Left, including writers, activists, poets and filmmakers, who have intervened politically through the medium of art. In the essay accompanying the catalogue to Sundaram’s exhibition at Munich’s Haus der Kunst, filmmaker and theorist Ashish Rajadhyaksha inscribes the multimedia artist’s career in a tradition that goes back to ‘the antifascist fronts of the 1930s, the progressive movements across the arts that have been aligned to various degrees with the Communist Party since World War II’. The history of art practice has rarely been scrutinised for its political claims and vexed relationship to the Communist Party. Moreover, the question of what political art itself is, and what art can do at a time when political gestures in the name of art abound and have become a requirement for showcasing in the global art scene, is today crucially relevant. Drawing attention to the conflicting trajectories of the term ‘politics’ in India, Rajadhyaksha explains, borrowing from political theorist Sudipta Kaviraj, that ‘institutional logic of democratic forms’ and the ‘logic of popular mobilization’ are pitted against one another in contemporary India. Such violent friction has pushed the country to a crisis in which the Indian state is no longer threatened from outside, but rather from the inside. It is to this growing sense of implosion, one that has also crucially affected, and afflicted, the Left in India, that Sundaram’s multimedia installations refer – in the forms of recursive memorial, critique of readymade legacies, and open-ended archive. Munich's Haus der Kunst and its then director Okwui Enwezor invited Deepak Ananth to curate Sundaram’s large retrospective ‘Disjunctures’. Ananth’s selection presented a sweep of Sundaram’s prolific career, one that has seen the artist move across media, from painting to more collaborative forms of installation and theatre production. Greeting the viewer was Sundaram’s playful sculpture Mill Re-Call (2015). 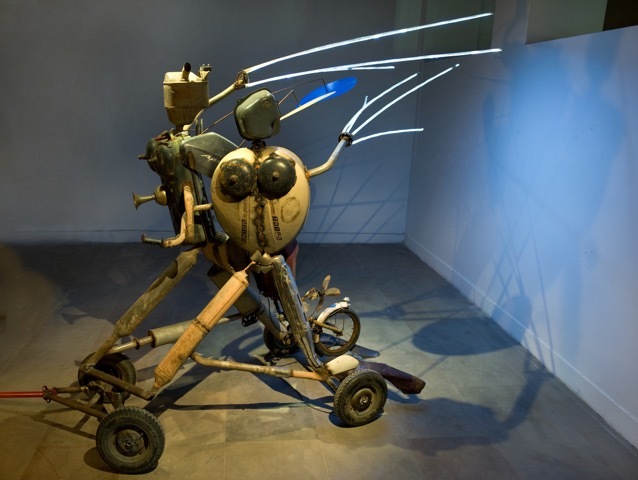 This anthropomorphic assemblage consists of car parts, exhaust pipes and protruding antenna-like LED lights carefully welded together by the artist. The sculpture functions as a kinetic tribute to modernist artist Ramkimkar Baij and his iconic Mill-Call (Koler Banshi, literally ‘machine call’), made in 1956 at Visva Bharati in rural Santiniketan. Enthused by speed, motion and the imagined promises anticipated by the machine age, Baij opted for ferroconcrete rather than clay and cow dung to create Mill-Call. Celebrating women workers on the move, the durable and rough materiality of the sculpture resonates with Jacob Epstein’s experimental treatments and his brief flirtation with Vorticism prior to the techno-horrors of World War I. Strongly rooted in social realism, Baij’s celebration of resilience and tribal labour was deliberately at odds with the Gandhian call for localism prevalent at Santiniketan. Sundaram rescues Baij’s techno-utopian aspirations to think through the emancipatory possibilities of modernity and the revolutionary hopes of the working classes. Begging to be animated, his robotic Mill Re-Call is a playful work that gestures toward the failed past-futures inspired by Baij and his monumental sculptural legacies. Recasting the peasant worker into a metal tin-man, Sundaram offers a conditional scenario to the rural utopia of self-sufficiency proposed by Gandhi. In this recouping of the future, India could be under the influence of the Russian Revolution and the development of Communism (a very real possibility in India from the 1940s up until the 1980s). In another installation also inspired by Baij, Sundaram populates a room with a riotous mass of fired-clay figurines. Produced collaboratively, One and the Many (2015) presents another retake on Baij’s sculptural works, including his Santhal Family (1938), a ferroconcrete homage to tribal motherly resilience. Originally conceived for 409 Ramkinkars, a theatre performance and installation, One and the Many plays with notions of craft, artisanal labour and scale. The simplicity and spontaneity of these gestural choreographies resonates with the radical and itinerant endeavours of the Indian People’s Theatre Association (IPTA), a group historically affiliated with the CPI. Theatrical in grandeur, but dystopian, was Sundaram’s ruminative installation Memorial (1993/2001/2014) accreted over the years in the aftermath of the communal carnage that erupted in the city of Mumbai between December 1992 and January 1993. The carnage was triggered by the destruction of the Babri Masjid (the sixteenth-century mosque situated in Ayodhya in Uttar Pradesh) by a rioting mob of Hindutva fanatics. Sprawled across the gallery space, Memorial evokes the space of an underground catacomb or open construction site and involves a mournful and difficult itinerary across an implied excavation ground. Sundaram desecrates the photograph of a dead man and, with cruel irony, covers his body with a blanket or a garland of rusty nails to perform his burial on behalf of an absented state. Messing up readymade minimalist vocabularies, Sundaram also questions the fate of secularism in India by toppling over and overturning industrial structures, including a miniaturised version of Tatlin’s unrealised Monument to the Third International. The techno-utopianism of Sundaram’s Mill Re-Call opens up into radical disillusionment through mimetic exacerbation of works by the Russian Kazimir Malevich and the minimalist Carl Andre. Yet, as pointed out by Kapur, Memorial can be seen to address the possibilities of collective mourning and memorialisation in terms of ‘the secular right to life of its own dead citizens’. 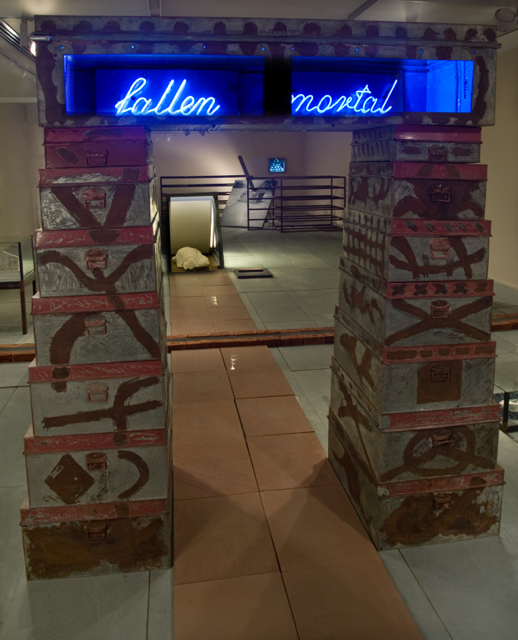 Closing off (and opening into) a neon passage, Memorial is more reminiscent of a bleak gateway with no exit in sight. Beyond Sundaram’s ongoing and prolific engagement with the readymade in his installations, several works on paper titled Engine Oil and Charcoal, produced in 1991, were especially striking. These sensitive drawings draw the viewer closer into their dirty, turbulent surfaces filled with wiry lines, dirty fumes, bones and maimed bodies. 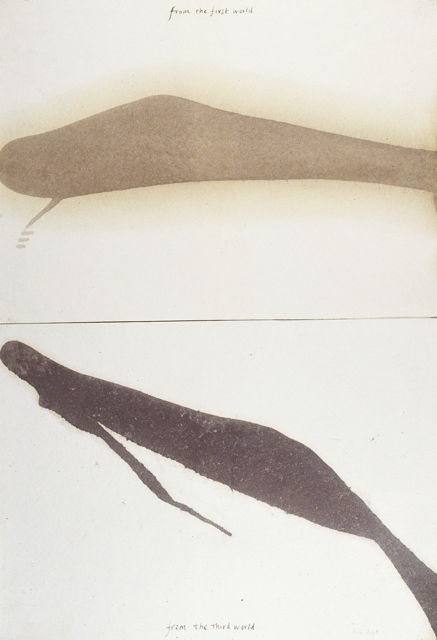 Conjuring the fluidity and toxicity of oil, Sundaram’s biomorphic shapes mimic deadly spillages and leaks, as with the enigmatic From the First World/From the Third World (1991). Ancient hieroglyphs buried in the sands allude to the landscapes of Iraq in the wake of the First Gulf War of that same year. Titles such as Land of Euphrates, Death of an Akkadian King and Mesopotamian Drawing anchor these ruinous sites to the lived histories of invasion and extractive destruction perpetrated on this once rich country. ‘Traces of annihilation are virtually the structural elements of the drawings’, writes Sundaram. The series Long Night: Drawings in Charcoal (1988–90) involves hallucinatory visions of destruction, hunger and death. Cosmopolitan affiliations could be further traced in the enigmatic Heights of Macchu Picchu (1972), a series of drawings the artist produced during the time of Salvador Allende’s presidency of Chile and which were inspired by the poetry of Pablo Neruda. Following an official invitation to Poland in the late 1980s, Sundaram also produced works such as Carcass and Barbed Wire, which figure the ruins of the Auschwitz-Birkenau camps. Sundaram, much aligned with socially engaged figurative and narrative painting up until the early 1990s, would put away his brush and paint after the communal carnage of 1993, increasingly taking up installation and collaborative forms of theatre production. Looking back at the drawings he produced in the 1970s and ’80s, the different registers and temporal worlds of avant-garde making in his long career are evident. ‘Disjunctures’ offered a landmark retrospective that celebrated Sundaram’s life-long investment in the categories of the political and the aesthetic across multiple media. Proposing a poetics of the fragment, the suturing back together, one memorably described by the Hindo-Pakistani writer Saadat Hasan Manto (‘I feel like I am always the one tearing everything up and forever sewing it back together’), Sundaram figures the volatility of the political, its chronic dangers and permanent insecurities, both present and future. To articulate a vanguard for the future from a place that continues to mutilate the present, putting the idea of political hope on hold and under prolongued duress, is the challenge Sundaram continues to step up to. The loopholes are there, Kapur and Sundaram have shown where to look out for them. ‘Proposition Avant-Garde: A View from the South’ in Exchange: Geeta Kapur, Saloni Mathur, and Rachel Weiss, 11 May 2018 (accessed 12 March, 2019) http://artjournal.collegeart.org/?p=9918. See also Kapur’s textual intervention Place for People of 1980, a radical manifesto published to accompany the landmark exhibition of the same title in Bombay. 'Place for People' sought to bring back the human figure in Indian art and reclaim a space for narrative painting in the aftermath of the Emergency. For further details, see Emilia Terracciano, Art and Emergency: Modernism in Twentieth-Century India (I B Tauris, 2018). See, for example, the conference ‘Axis of Solidarity: Landmarks, Platforms, Futures’ organised by and hosted at Tate Modern, London, on 23/24 February 2019; and the itinerant exhibition ‘Awakenings: Art in Society in Asia 1960s–1990s’ jointly organised over a period of five years by three national museums in Japan, Korea and Singapore, and the Japan Foundation Asia Center. The exhibition is at the National Museum of Modern and Contemporary Art (MMCA), Gwacheon, Korea until May 2019 before travelling to Singapore. Kapur, ‘Proposition Avant-Garde: A View from the South’, op cit. The Bandung Conference in 1955 in Bandung, Indonesia, was the first and largest conference gathering involving Asian and African states, most of which were newly independent. The aims of the Conference were to promote Asian-African economic and cultural cooperation and to fight novel and widespread forms of global colonialism. It is regarded as the foundational step toward the creation of the Non-Aligned Movement. Eleven years later, the 1966 Tricontinental Conference in Havana, Cuba built on the Bandung Conference to radicalise the idea of a non-aligned movement and promote the construction of a Third World anti-imperialist and often anti-capitalism project. Moroccan socialist leader and organiser of the Conference, Mehdi Ben Barka, promoted the merging of ‘the two great currents of world revolution: that which was born in 1917 with the Russian Revolution, and that which represents the anti-imperialist and national liberation movements of today’. Saloni Mathur, https://www.dukeupress.edu/a-fragile-inheritance (accessed on 7 March, 2019). Mathur’s book, A Fragile Inheritance: Radical Stakes in Contemporary Art is forthcoming (2019) from Duke University Press. 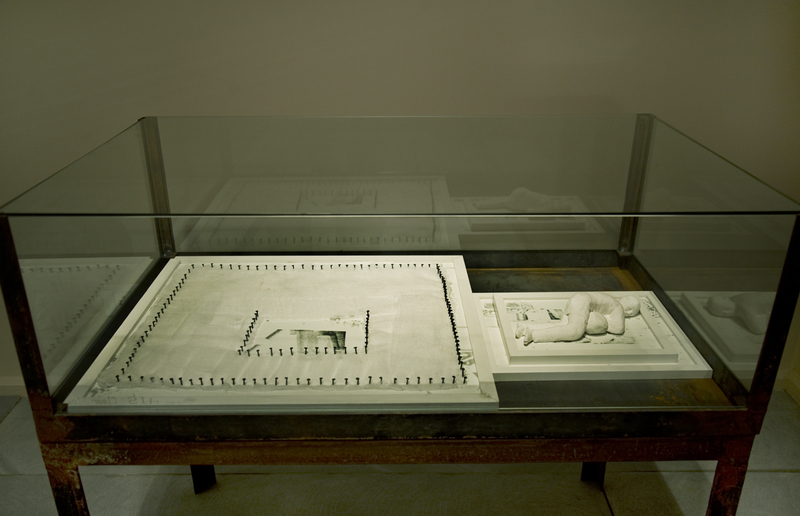 Geeta Kapur, ‘Art and the Historical Imaginary’, paper delivered at Art/Critical Perspectives Symposium, an initiative of the ECA/University of São Paulo Center for Studies in Modern and Contemporary Art, São Paulo, Brazil, November 2007; see https://cdn.aaa.org.hk/_source/digital_collection/fedora_extracted/20824.pdf (accessed March 9, 2019). Emilia Terracciano is the TORCH/Ruskin AW Mellon Global South Fellow, Bowra Junior Research Fellow in the Humanities at Wadham College, University of Oxford, and was previously a Leverhulme Early Career Fellow at the Ruskin School of Art, University of Oxford, from 2015–2018.